A Garden that works for me. pH, VERY IMPORTANT…DO NOT SKIP THIS STEP! The pH of your garden soil is critical. It’s like the conductor of the symphony, or the key to unlock the door to the nutrients, so the plants can get to the amendments you added. If this isn’t correct (too high or too low) your plants will not be able to absorb all the nutrient amendments you added and will be sickly, subject to insect attacks, diseases and just sit there unproductive. The pH test you do every year will tell whether to add ground limestone or sulfur (best done in the fall to let it work into the soil) to bring your soil to an acceptable number. The pH test range is between 0-14 with 0 being very acidic and 14 being very alkaline and 7.0 as neutral. Generally speaking, the soil in the eastern United States is usually on the acidic side of neutral and the soil in the western United States is usually on the alkaline side of neutral. Most vegetables do well with a number slightly below neutral around 6.5, but don’t sweat the decimal point. The bag of limestone or sulfur will have the manufacturer’s recommendations of how much to add, based on you test. 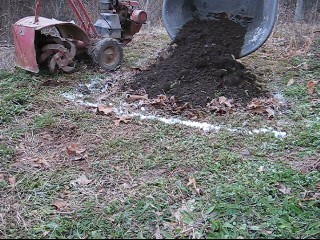 You can also use this first addition of lime to help you mark the outline of your garden plot like is done for a football field. Note: Do not use limestone in the area you are going to plant potatoes because they need a slightly more acidic soil than most plants and a sweet soil will promote diseases on potatoes. In short, composting is the process of managing a pile of decaying vegetation, such as leaves, grass clippings, etc. and allowing the materials to rot (decompose) for a period of time into fine particles which in turn feed the plants. This can be accomplished in a matter of weeks by turning over the pile every few days, or if left sitting can take a year; but I find that successive rains will wash away a lot of the good elements of the organic materials. I practiced composting for many years and still have a compost pile, but I use it as a dumping ground for excess waste vegetation, such as cornstalks and weeds, that will eventually rot to the point it can be useful in the garden. I take the leaves to a spot in my yard and scatter them in a thin layer and then run my mower over them several times to chop them into small pieces, aiming the side discharge shoot toward the center so as to end up with a row of chopped leaves. This will help the leaves break down faster, make them easier to handle and they will not blow around so much. Leaves make an excellent mulch to help retain soil moisture, prevent weed growth and feed the earthworms and plants. After running the leaves over with my mower I attach the mower bag and vacuum them up with the mower and take them to the garden. 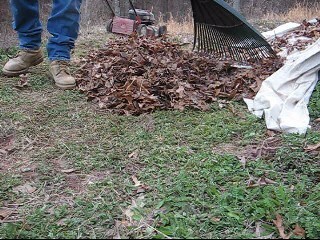 After vacuuming up the leaves, I usually have to rake the spot in my yard where I did this to get all the smaller pieces up off the grass. If I am ready for them to go on the ground, I spread them on in about a 3” layer. At this point you can till them in, or let them lay on top as mulch around the plants, but do not cover seeds with leaves or they will block the sunlight and the seeds will not sprout. If you’re not ready to use them, you can bag them to have on hand when you need them and you can never have too many leaves to add, so get as many as you can. In the fall you can just till them in whole without the chopping step, but save some for the spring as mulch. Fresh grass clippings are loaded with nitrogen. If you’ve ever piled up grass clippings and came back a few hours later; you likely found them to be very hot and smelling like ammonia; that’s the nitrogen at work. Nitrogen is an element that is critical to leaf growth on plants, so if you’re going to plant spinach or other leafy vegetables, this nutrient is needed in hefty doses. Also, a combination of brown leaves and green grass clippings will make the compost pile break down fast and steam will rise from the pile as you turn it over. Grass clippings need to be processed almost immediately while they are loose and easy to handle. If left in a pile on the ground they will soon become unmanageable and when dry will be like a woven mat. You can till grass clippings into the soil, or sprinkle them on top of the shredded leaves (mulch) and they will act like a mat to hold the shredded leaves in place. If I do not have enough leaves for mulch, I use grass clippings as mulch. Any green leaf materials will do wonders for the soil, these are known as green manure; so save the kitchen scraps for the garden, but do not use meat scraps. Your neighbors might bag their clippings to go to the landfill, so ask them if you can have them, keeping in mind that they must be used almost immediately. Be sure to ask if they have used any chemicals on their lawn such as weed killers or insecticides because most weed killing chemicals will kill your vegetable plants. When you hear someone say that manure is hot, they are not necessarily referring to its temperature. Fresh manure is generally acidic (or hot) high in nitrogen and; if fresh manure comes into contact with the plant roots, it will burn the roots and could actually kill the plants. If you have a dog and a lawn you know what I mean. However, after the deposit of a dog or other animal has aged, you may notice that the grass in that spot is now lush and deep green in color. That’s because the surrounding grass that survived the burn is now benefiting from the nutrients in the manure. However, do not use dog or cat waste in your garden. There are a multitude of bagged manures on the market and they are composted and ready to add without fear of burning the roots. I add fresh when I have nothing else, but this should be done with care not to get close to the roots. 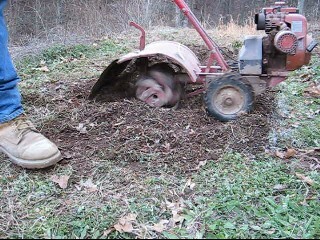 I place fresh manure several inches from the base of the plants and in a shallow trench and then cover it with soil. By the time the roots get to the manure, it has cooled to the point that roots are less likely to burn. Composted or not, if you find a source of free manure take it! Keeping fresh manure in a pile to compost for months or a season will lower the burn factor; be sure to cover the pile with a tarp to keep the rain from washing away the nutrients. I have never paid for manure, but I have paid to have it delivered. Most people who have these animals have more manure than they can use and will gladly give it to you, but they will likely want you to load and haul it. If you want to be purely organic in your gardening, you’ll want to know what they feed their animals. If you are just beginning a garden then you will likely need a rotor-tiller to break up the ground and to add your amendments. You do not have to own one, but if you rent one, get the biggest and most powerful one they have, even if you have to wait a week to reserve the rental. A five horse power, or more, will make the job a whole lot easier because you will have to go over the area at least three times and go as deep as you can to do this right. 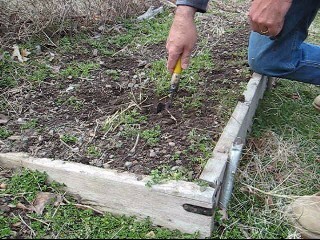 This initial ground breaking can be done by hand with a shovel if your soil is soft enough to do so and I’ll touch on that in the second half of the video titled Episode Two. Basically it is just plunging the shovel into the ground to the full depth of the blade and then flipping over the resulting core of dirt. Although the majority of plant roots are in the top few inches, tilling deep will break up the subsoil and allow the deep reaching roots to find water easier. I would avoid the tillers with the tines in the front as these tend to be hard to control and are almost more work than they are help. A rear tined tiller (blades that spin behind the drive wheels) is easier by far to operate and in my opinion does a better job. However, if a front tine tiller is all that is available then you will have to settle for that. Take the whole day to till the garden if you have to, add all the amendments you need and all you can get for this first tilling. This is the main event; so have all the additives you need: limestone, sand, leaves, manure, compost, on site and ready to go! You can put on the amendments first, days before, if you want to save some rental time later while using the tiller. Renting a tiller will be costly, but trust me it is worth every penny. If you have neighbors close by, talk with them about sharing the tiller and the rental fee. If you are going to pick up the tiller; get to the rental shop as soon as it opens to use every minute of the day’s rental to get your money’s worth. The more you till the better the mixing and the better conditioning elements will be worked into the soil. Another possibility is that a farmer in your area might come over with his tractor and disk to till the area for a reasonable fee and this will reduce tilling time to minutes instead of hours. Once you have your soil conditioned to the best consistency, you’ll find you do not need a tiller as much, if at all. I practice what is called no-till gardening, where you add amendments to the top of the soil, or scratch them into the top layer. Look at the forest floor and you will see that is how nature does it. However, you need to do that first tilling to condition the soil; especially if you’re adding sand because your soil is mostly clay. Never try to go full depth with a tiller on the first and probably not the second or third pass, or the tiller will buck out of control, depending on the ground you’re working. Run the tiller over the entire area and overlap as you go to ensure you get all the ground tilled; then after you finish the first pass (left and right) till in a perpendicular direction, back and forth, alternating after each pass until reaching the full depth capacity of the tiller. If you choose to add the amendments as you go; then after the first or second pass you can add your amendments and till them into the ground. This will allow you to see the ground you’re tilling and give you an idea of how things are going; as well as allowing you to see what the dirt below is like. Some say that you must remove the grass (sod) from the garden area before tilling; I say phooey, that’s more unnecessary work. You’re going to grind it to a pulp anyway and sod is organic material so let it stay. Besides, you’re going to mulch the garden, so the grass will not be an issue. If you’re concerned about the grass coming back, you can kill it by covering it up for a few weeks, but who has the time for that?